Sarah Tracy, professor in Arizona State University’s Hugh Downs School of Human Communication, believes in the importance of discovering different methods and approaches for encountering the world. She teaches students to become experts on personal happiness and leadership. Article available here: ASU professor teaching students to become experts on happiness, leadership. “Compassion in the Face of Terror” discusses how empathy can save lives. 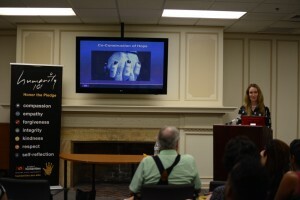 Article in The State Press covers highlights of the compelling presentation that took place in September 2015 through Arizona State University’s Project Humanities and sponsored through the Transformation Project. The following are some articles of over 50 media contributions where I have shared practical implications of my research with media consumers, extended the reach of my scholarship, and aimed to provide positive publicity for ASU and the Hugh Downs School of Human Communication. Arizona Republic. Story highlighting my scholarly work on creating healthy habits. Sexton, C. C. (Jan, 2014). Valley Residents Resolve to Improve Lives in Ways Big and Small. EHS Today, The Magazine for Environment, Health and Safety Leaders (accessed January,2011). Compassion: Cure for an Ailing Workplace (picked up my column written for NCA’s Communication Currents. – Busting the Office Bully” white paper. The piece was also distributed to thousands of readers during April 2007, through outlets including “Yahoo. Agnihotri, Iti, (March, 2013). ASU News. Sunshine for Sun Devils encourages kindness through action. Story about PWWL’s Sunshine for SunDevil’s project. This video highlights the Spring 2013 Sunshine for SunDevils Project.